This turns out to be a combination of recipe and art project. Among the necessary culinary ingredients are chocolate and vanilla ice cream, whipped topping, and sandwich cookies. 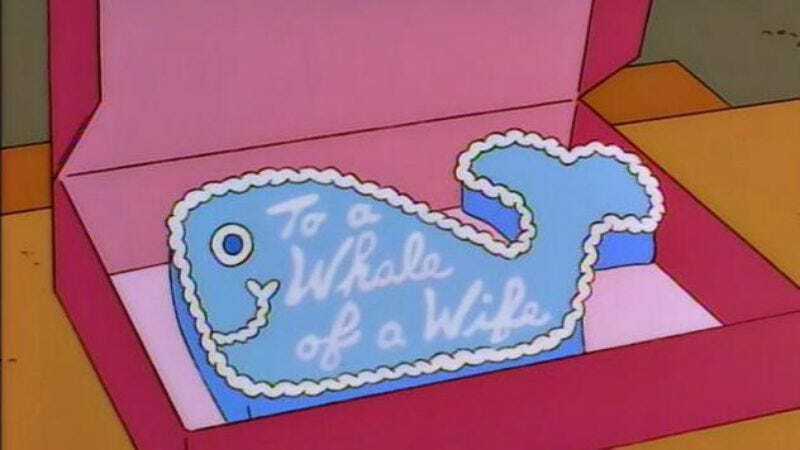 None of that will make a cake whale-shaped, so Randolph also prescribes plastic wrap, a hot-glue gun, an X-Acto knife, and “some awesome cardboard skills.” The idea is to make a cardboard whale template, line it with plastic wrap, and add the ingredients as directed. “A Milhouse Divided” is remembered for the song “Can I Borrow A Feeling?” by Kirk Van Houten, but dedicated Simpsons fans will likely have to borrow more than that to make this project a reality. Best of luck to those who dare.